The name Bahamas comes from the Spanish words of “Baja Mar”, meaning, “shallow water” or “low tide”. Originally inhabited by the Lucayan Indians, the Bahamas was the site where Christopher Columbus discovered the New World in 1492. Although the Spanish never colonized the Bahamas, they did ship the natives to Hispaniola (Haiti and the Dominican Republic). The Bahamas remained mostly deserted until 1648 when English colonists settled on the Island of Eleuthera. The Bahamas is an island country, consisting of more than 700 islands (30 inhabited), cays and islets in the Atlantic Ocean. Most people think the Bahamas are in the Caribbean but they are not. The Bahamas lie just east of the Florida Keys, north of Cuba and Hispaniola, northwest of the Turks and Caicos Islands. The Bahamas became a British Crown Colony in 1718. This occurred as the British were cracking down on piracy. You can only imagine the haven this area was for pirates in those days, including the infamous Blackbeard. After the American Revolution, thousands of British loyalists fled to the Bahamas taking their slaves with them. They began a cotton plantation economy. Today, 85 percent of the population are descendants from Africa. Slavery in the Bahamas was finally abolished in 1834. Once freed, most that had been enslaved, stayed on the Island and began trades such as fishing and shipbuilding. The Bahamas gained her independence, peacefully in 1973, retaining Queen Elizabeth II as her monarch. 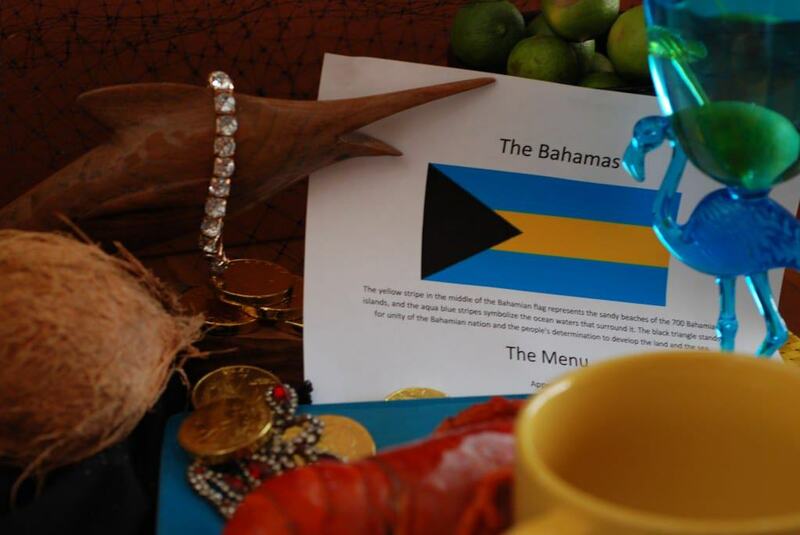 This is celebrated on July 10 each year as Bahamian Independence Day. There remains a symbolic link to her English roots as the Royal Bahamas Police Force Band performs in observance of the historical “changing of the guards.” This occurs at the Government house in Nassau every two weeks. During the days of slavery, three days around Christmas, the slaves were given time off to celebrate their culture. It is believed that this was the origin of the Bahamas’ famous Junkanoo festival that begins December 26th. A parade invigorates the town with energy, music and a vibe so intoxicating that it gets the crowd up on their feet to join in the celebration. Junkanoo rivals Mardi Gras, in New Orleans and Carnival, in Rio de Janeiro, as one of the most enthralling of festivals. Bush medicine is another important aspect of Bahamian culture with over 100 native plants that can reliably be used for medicinal purposes. This skill was brought to the islands by the slaves of West Africa. 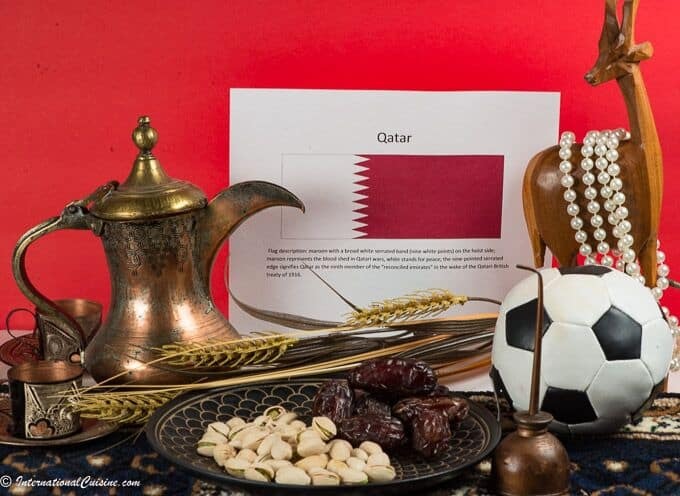 Today, tourism is the main eco source. The Bahamas are a tropical, romantic paradise, with endless sandy beaches, cool tropical weather, crystal clear waters, bountiful fishing and incredible sunsets. When you arrive at the airport in Nassau, you will be greeted with music and dancers and offered a refreshing rum punch to welcome you to their unique and festive country. I am not sure where else such a welcoming ritual exists. The music is the soul of the people of the Bahamas. African rhythms, calypso, English folk songs and the uniquely Bahamian “Goombay,” which refers to a type of goatskin drum that is used to produce the rolling beat, are the most intrinsic. Rake and Scrape bands have been playing Goombay music since the time of slavery. Key West, Florida even celebrates this music with a two day festival, in honor of their Bahamian neighbors. Bahamian cuisine refers to the food and beverage culture of the Bahamas. The English, the West African heritage of the slaves, as well as the Bahamas being a nation of islands, all influence the cuisine. 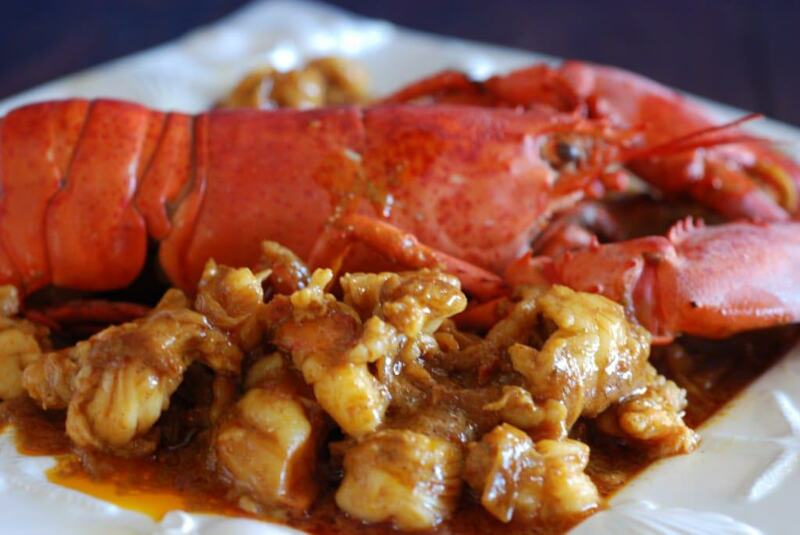 Bahamian cuisine includes an amazing variety of fresh fish and shellfish such as lobster, shrimp, crab and conch; a mollusk rendering a sweet white sumptuous meat. Tropical fruits of every variety abound as well as rice, peas and potatoes. Some common seasonings used in dishes include; chilies, lime, cilantro, garlic, allspice, and cinnamon. Rum and coconut milk are also commonly used ingredients. Rum-based beverages are ever so popular on the islands. Who couldn’t make an incredible feast out of these abundant staples? 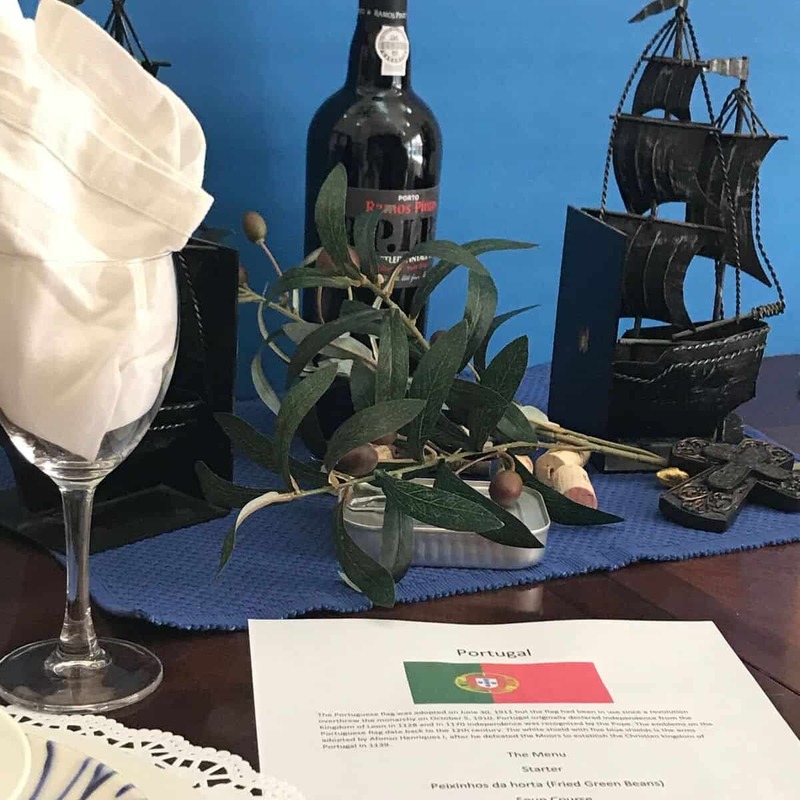 We set the table using the colors of the Bahamian flag, blue, yellow and black, representing the sun and the sea and the unity of the Bahamian nation. For our centerpiece we chose a pirate’s booty plus a hand carved blue marlin, representing their national fish. We used some fun flamingo glasses to hold our “Bahama Mama” cocktail, as the flamingo is their national bird. We put on some calypso, Bahamian music and sat down to a fantastic meal to enjoy with our special guests visiting from Texas. 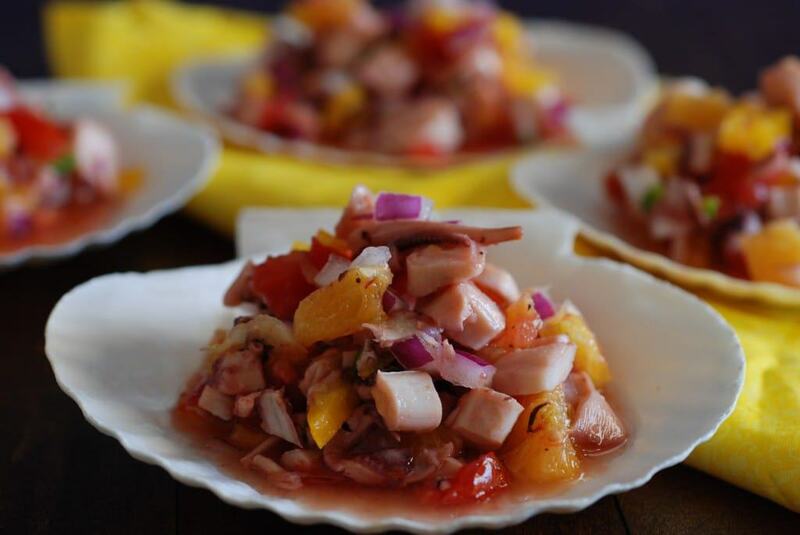 The appetizer should have been made with conch, pronounced “konk,” but could not be found in my neck of the woods. So, I substituted a can of “California Girl,” imitation octopus or pulpo, made out of calamari. The flavor and texture was perfect, sprinkled with a little Old Sour, a hot and sour pepper sauce, which made for a wonderful appetizer. The next course was the chicken souse and Johnny cakes. 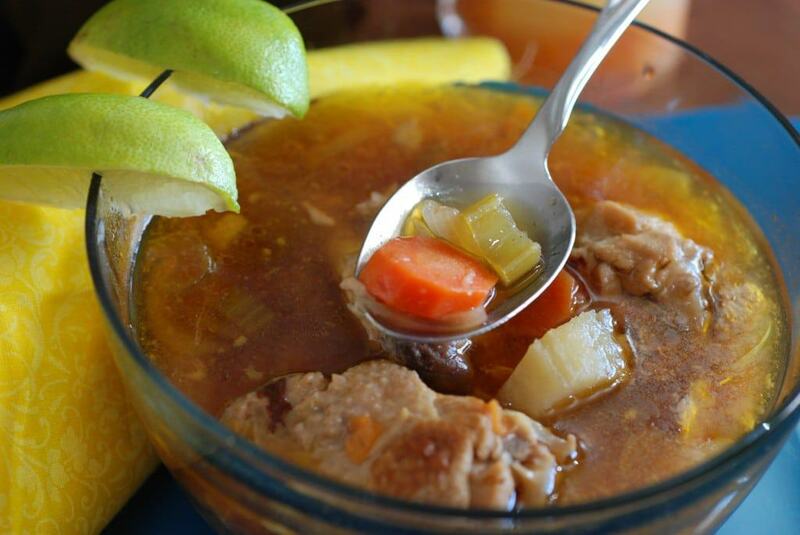 Chicken souse pronounced “”Sow-se” is the same word used for someone who is drunk and is also known as the Bahamian hangover cure. 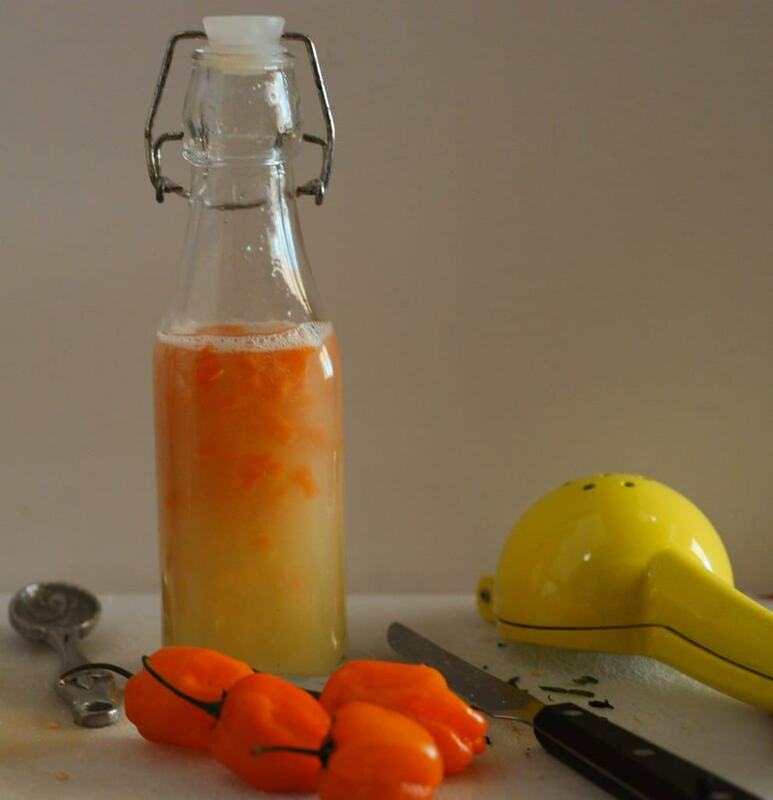 This chicken type soup is made with lots of lime, allspice and chili peppers. In fact, most people like their food spicy hot in the Bahamas. You can, of course, adjust the heat with the amount of chili you use. 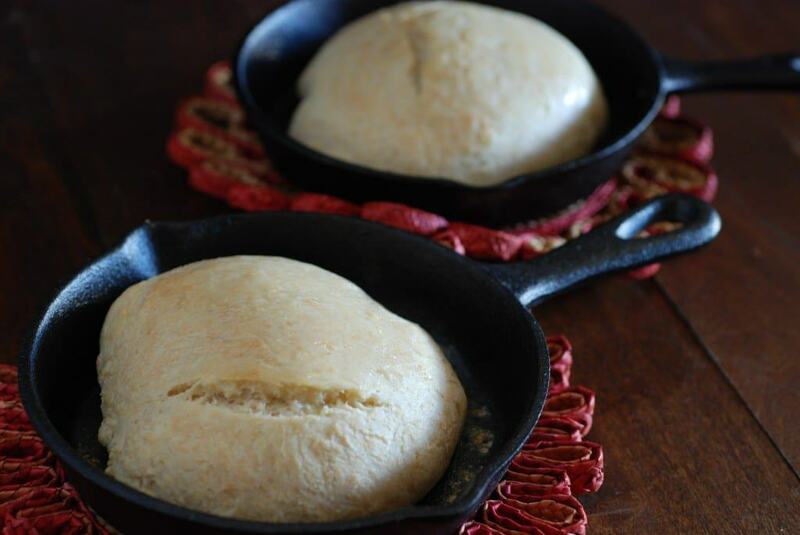 This dish is always served with Johnny cake, which is a cross between a cornbread and sweet biscuit; the perfect accompaniment to sop up the broth of the souse. For the main course we had lobster curry, perfectly cooked, in a creamy curry sauce. The spinney lobster is ubiquitous in the Bahamas and offers a sweet and rich flavor. The curry influence comes from West Africa and the coconut milk, from the tropical islands. 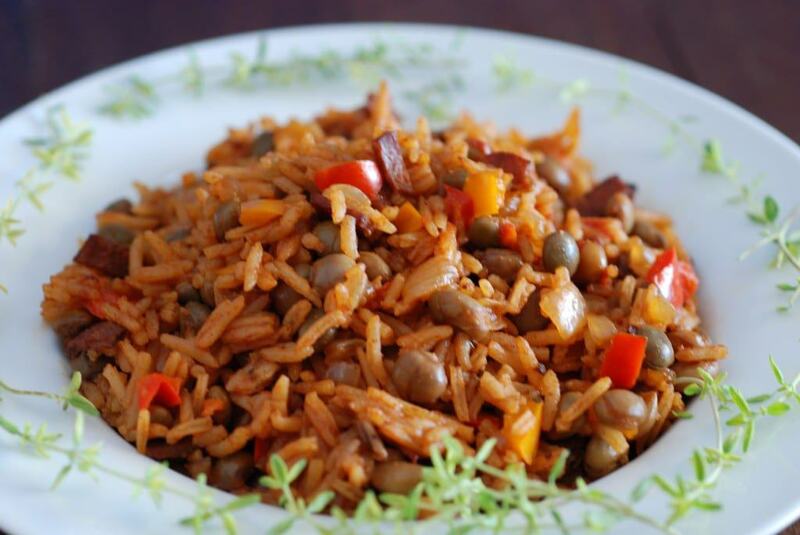 We served this dish with pigeon peas and rice, (pigeon peas are actually beans in their own right.) It was delicious. 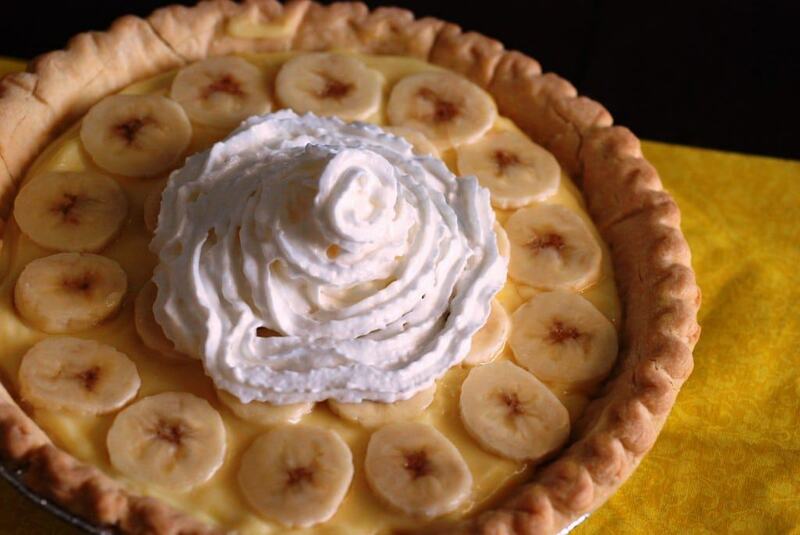 We finished the meal with a banana cream pie, served with whipped cream; a perfect ending to our Bahamian feast. Adam, thank you so much for your kind words, to be honest it is absolutely those that keep me going. Cook the curry, it’s easy and you will love it!